Hi everyone. 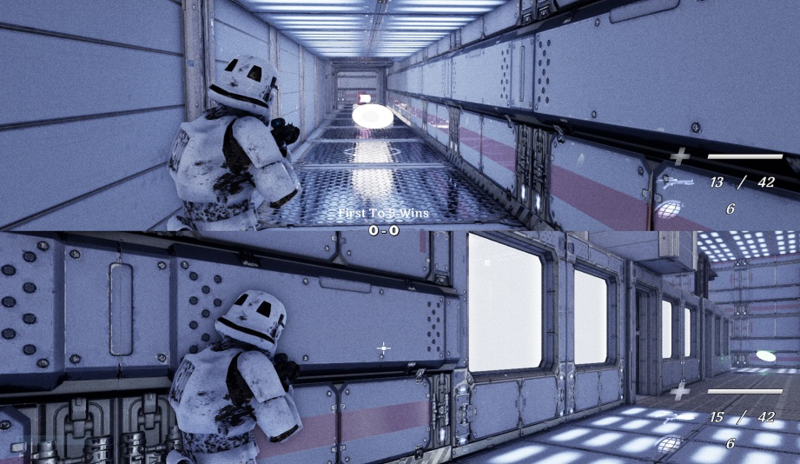 I made a two player split-screen shooter linked above. This prototype only has one level and no single player campaign for now. I was looking for feedback as to where I'm going wrong, how I can improve etc. Technical issues, game design feedback and what have you. It's an Unreal Engine game so the min specs are probably a bit high. I've had a few views probably due to the tongue in cheek title. But feedback-wise so far I've got a single one star rating but no comments as to what was wrong, how I can make it better. the in game graphics look fab! Would you give feedback for my output, too? Had a look at your latest output. Good Java based puzzle game. I reckon to take things to the next level using the Java language, check out Processing (a graphical sketchpad for creative coding, I've used it a bunch of times, you can make really neat stuff in it including 3D) or jMonkeyEngine(never used it myself but heard good things about it). Yes, Thank You for that. I want to get into writing an Adventure game. Any suggestions, Please ? I mean do you know any programs used in Adventure making ? Maybe Unity with the Adventure Creator plugin? Or Unreal with the Not Yet Dialogue plugin. Did you play Thimbleweed Park ? New version uploaded with two new maps and some UI updates.